This past weekend I visited Ontario, Canada to learn a bit more about the delicious ice wines that they produce at their annual Niagara Ice Wine Festival as well as getting a great introduction to the region. 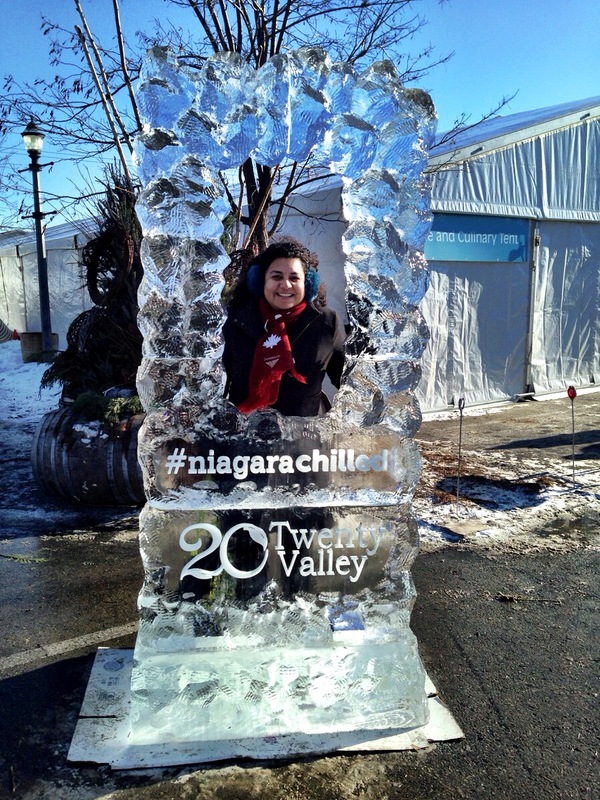 The Niagara Ice Wine Festival has been going on since the 1990’s and is your chance to sample all that gorgeous golden (and ruby red) nectar. For those of your unfamiliar with ice wine, it is most famously made from the riesling grape in Germany and Austria – where it get’s cold enough for the berries to freeze in winter. Although it’s debatable as to who made the first ice wines in Ontario, most attribute it to the Inniskillen winery which was one of the wineries we visited while we were there. The most popular grape used in Ontario is the vidal grape which is a hybrid of ugni blanc and Rayon d’Or (I’d never heard of Rayon d’Or either). It was originally produced to be used in Cognac but somehow found its way to Canada where it has a happy home. 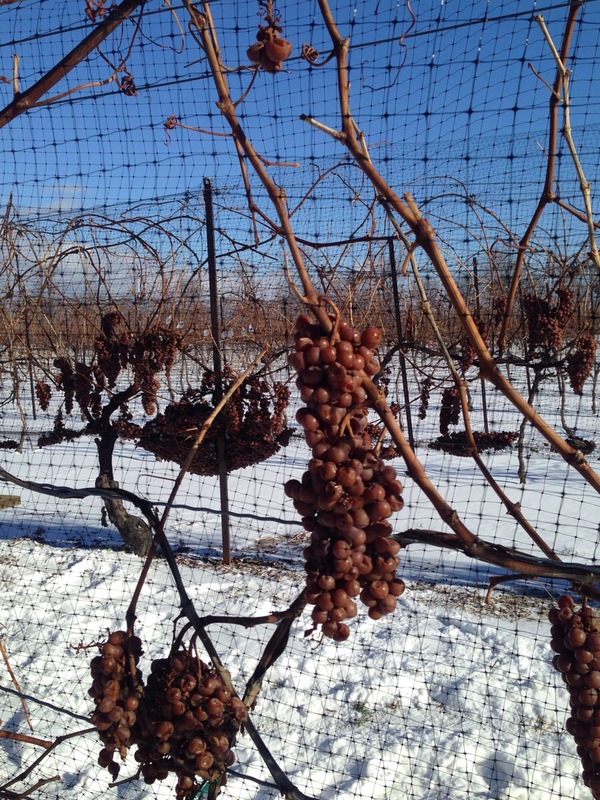 Ice wine can’t be produced until the temperature stays at -8C for at least a few days. This is to ensure that the grapes picked are frozen through. There can be some thawing during the day but they must be literally hard as a rock to be picked. For this reason, most harvesting is done at night, when the temperature drops. Ice wine is also made from the cabernet franc grape.We had the opportunity to try cab franc ice wines while we were there and I have to say that despite my trepidation, cab franc makes a fabulous ice wine. 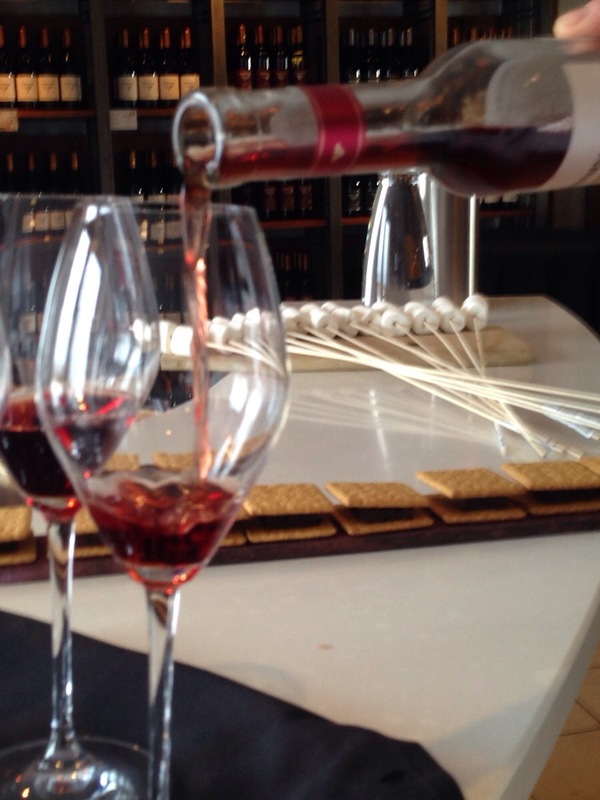 At Inniskillen we had their cab franc ice wine paired with S’mores (a marshmallow, dark chocolate and graham cracker concoction – if you grew up going to camp as a kid in N. America, you’ll know exactly what I’m talking about). It’s quite easy to make S’mores with all the wood burning camp fires set up at the wineries. Seeing as it was between -18C and -25C while we were there, it only seems to make sense to have camp fires if you’re going to be outside in winter. And, funnily enough, the Canadians don’t seem to mind standing around in sub-zero temperatures when the sun is out, as long as there is a fire to keep warm. The Festival does take place in the great Outdoors but the main exhibition area is inside a giant tent which helps to keep you warm. The Festival is taking place from the 9- 25th of Jan and every weekend, it moves to a different town around Niagara and Niagara-on-the-Lake. Niagara-on-the-Lake is the charming town where we stayed while there and it has stuck to its historical roots. All the buildings in town must adhere to strict historical building regulations and none can be higher than the town clock, which is roughly 3 stories tall. We discovered that most of the town was burnt down during the War of 1812 on a carriage ride we took around town, so the architectural style is early 19th century. 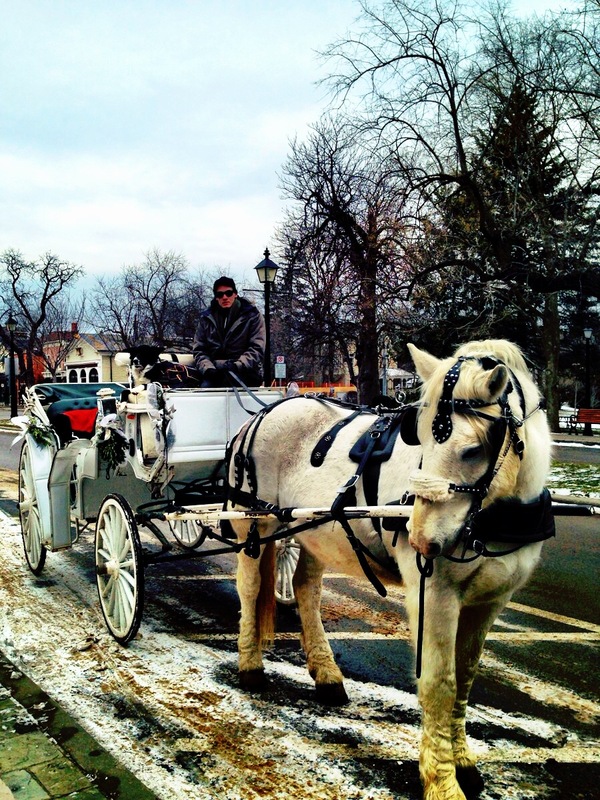 There is plenty to do in the area, even in winter. 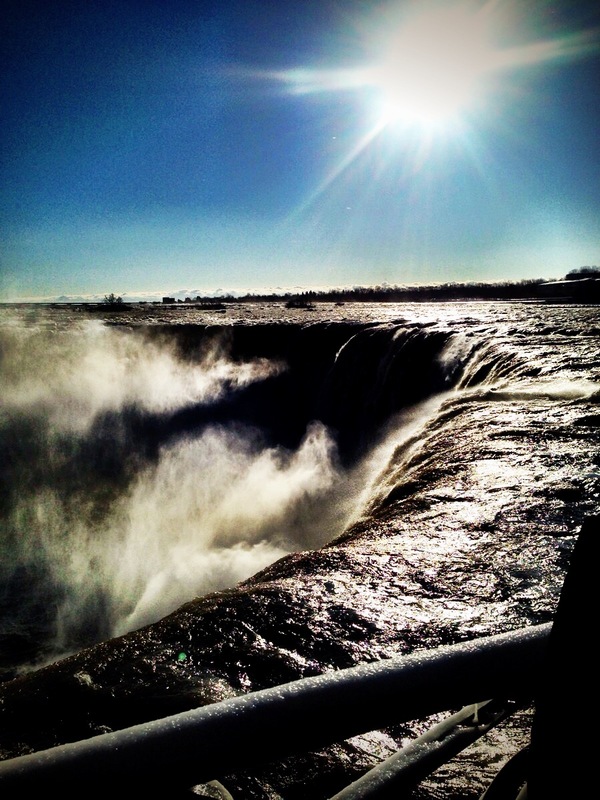 For starters, you have to visit Niagara Falls. No visit to the area would be complete without at least driving by the Falls. It’s hard to miss them as one of the main roads in the area goes right past them, but why would you want to give them a miss? Even in winter, they are impressive and spectacular. 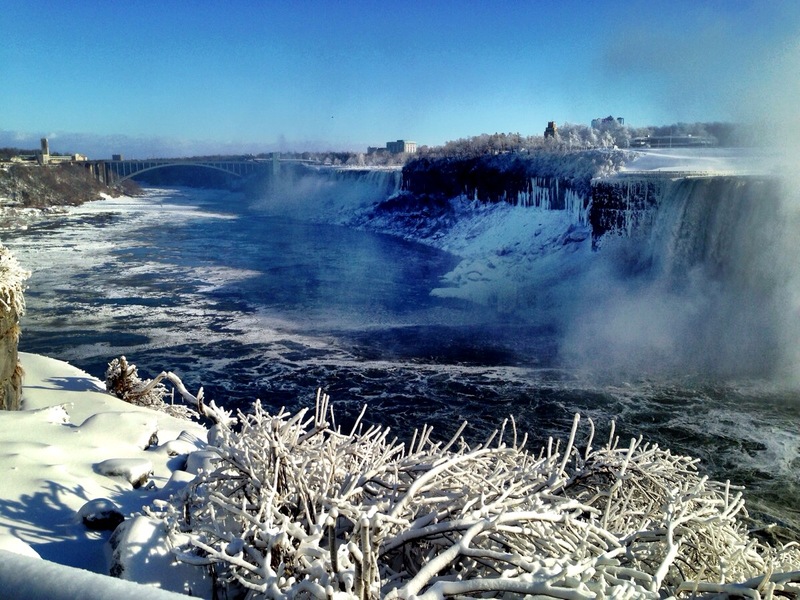 Some of the observation decks are open and it is possible to get up close and personal with the Falls, just watch out for the freezing cold spray that the wind seeemed determined to spray in our faces. To see the Falls, there is a visitor’s centre at Table Rock. Table Rock is very well set up, with observation decks, the White Water walk behind the Falls and a 4-D show called Niagara’s Fury. In the summer there is also a Whirlpool Aero Car which traverses the Falls from one side to the other. Or you can take a helicopter ride over and around the Falls with Niagara Helicopters. As it was a windy day, I declined but my fellow journos took a spin and said the views were amazing. I saw the pictures and I almost wish I had gone on the helicopter! Canada is, of course, known for it’s maple syrup. We visited the White Meadow Farms, where one of the owners, Ann, gave us a run through into how maple syrup is produced. Basically, it’s ‘tapped’ from the tree in Spring and then boiled down. 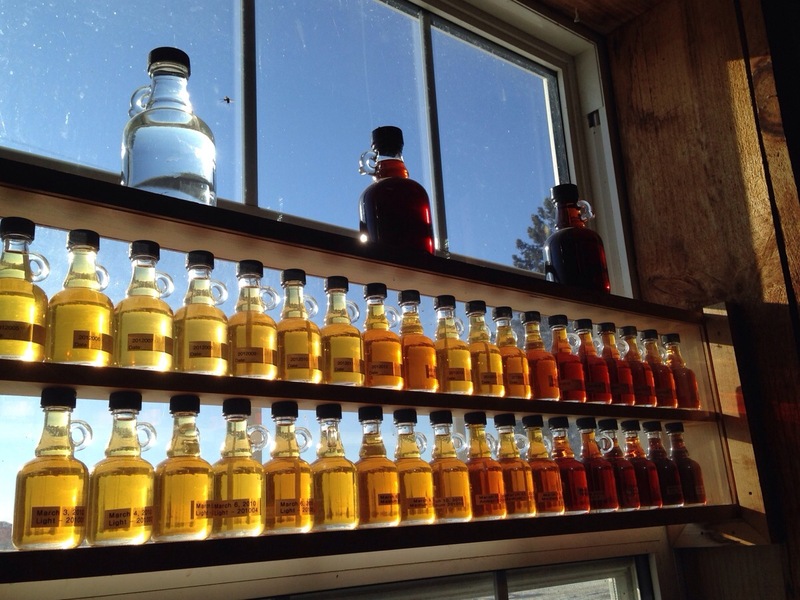 Maple syrup has various grades according to when it is tapped from the tree. The later in the season, the darker the syrup. We also learned that it has many anti-oxidants and minerals and a glass of maple syrup has has much calcium as a glass of milk but as Ann noted, who could drink a glass of maple syrup! After all that maple syrup and ice wine, it was nice to return to our lovely hotel, The Pillar and Post in Niagara-on-the-Lake. The hotel is part of the Vintage Hotels group and they have 5 different hotels in the town, all very quaint but with all the mod-cons. 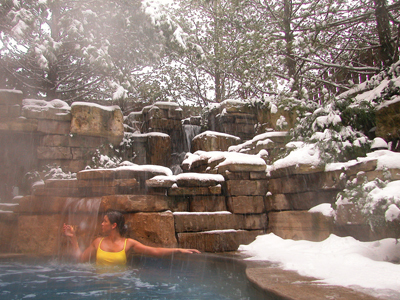 The Pillar and Post has a fantastic spa that was voted #1 Spa in Canada (by Spas of America) in 2013. My favourite part of the spa was the outdoor hot spring. If I wasn’t in my room, you could find me in the hot spring. There’s something magical about sitting outdoors in a pool of bubbling hot water – and when it started to snow while I was soaking, it just doesn’t get any better than that. The hotel offers vino spa treatments, in keeping with the wine growing theme of the region. I had the Beyond Vino Facial and I do believe that’s the first time wine has re-hydrated me rather then dehydrated me. Despite the cold temperatures, my long weekend in Ontario, Canada was all too short. As a Norwegian friend of mine says, there is no such thing as being cold if you’re properly dressed for the weather. The Niagara Ice Wine Festival takes place every year around this time of year so if you can’t make it these next two weekends, there’s always next year.